Industry and Idleness Rewarded, artist unknown, c.1775, Colonial Williamsburg. 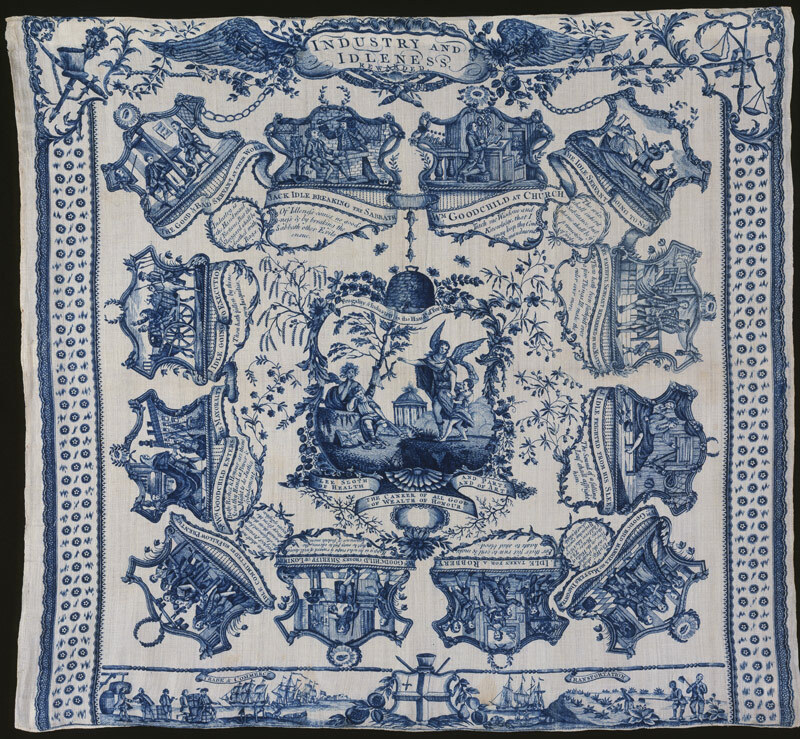 This decorative handkerchief is a morality tale of two servants, William Goodchild and Jack Idle. These Goofus and Gallant characters follow very different paths. Goodchild becomes a high ranking political figure, while Idle is put to death. A trope of sailors in fiction is their inherent immorality. This predates the eighteenth century, as in the novel Robinson Crusoe, wherein the title character often laments his sinful life, but says little about what he did wrong besides ignoring his father's advice and becoming a sailor. Such is the case here. Jack Idle goes to sea in a scene reminiscent of William Hogarth's "The Idle Prentice Turn'd Away and Sent to Sea." 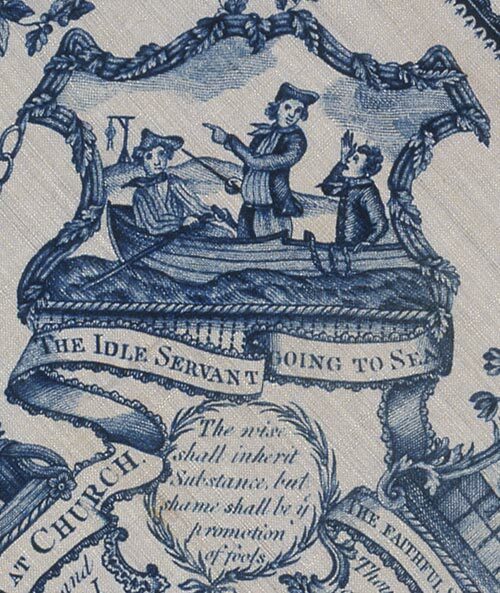 Jacke Idle is shown being rowed to sea, and is directed to observe the gallows over the sea, bearing a corpse as a warning to sailors. Beneath this frame is a Biblical verse surrounded in a wreath: "The wise shall inherit Substance, but shame shall be ye promotion of fools." This is an interesting translation of Proverbs 3:35, which is usually translated (and was at the time in the King James' Version of the Bible) as "The wise shall inherit glory" or "honor." This translation, and indeed the print as a whole, links wealth and political success to virtue. Bad fortune and destitution, meanwhile, are linked to vice. Sailors then, as low class laborers, are inherently vicious. Jack Idle, furthest aft, wears his own curly hair cut fairly short over a dark neckcloth and single breasted jacket. The sailor standing amidships wears a cocked hat bound in white taps, a bob wig or bob wig style of hair, a light neckcloth and short jacket with slit cuffs. His shirt may be striped and he is without waistcoat. Around his waist are a pair of petticoat trousers. 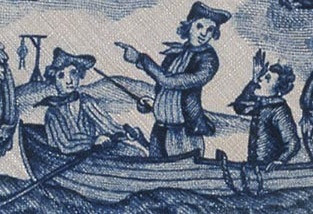 The oarsman wears a plain cocked hat, short hair, a dark neckcloth, and a single breasted striped jacket. 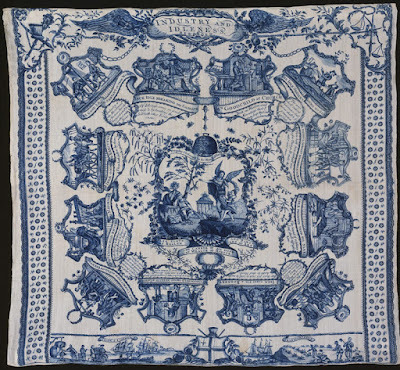 At the base of the handkerchief is a pair of illustrations showing the further rewards awaiting idleness and virtue. Ont he left is "Trade & Commerce," showing William Goodchild shaking hands with a Spaniard, while a Dutchman smokes his pipe. A bound crate bearing his initials is ashore, and more goods are being carried there. Jack Idle, had he not been hanged, would certainly have been transported as a convict servant to Virginia or Maryland. His fate was to be equated with the enslaved shown hoeing tobacco plants.